As important to an airplane as wheels are to a car: the wing. On the VC10 this wing was deliberately designed to permit good low speed handling and kept clean, neccesitating the rear engined installation. The VC10 wing was not an instant success though and in this article I've tried to list the various steps that were taken to get the wing to perform as it should. 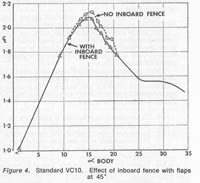 Closely related to this are the various other aerodynamical changes that were introduced to improve the VC10's performance in cruise, so these are also included on this page. I'm indebted to Ian Kirby for his recollections from the development program and also listened with great interest to Mike Salisbury's talk at the VC10's 50th anniversary. 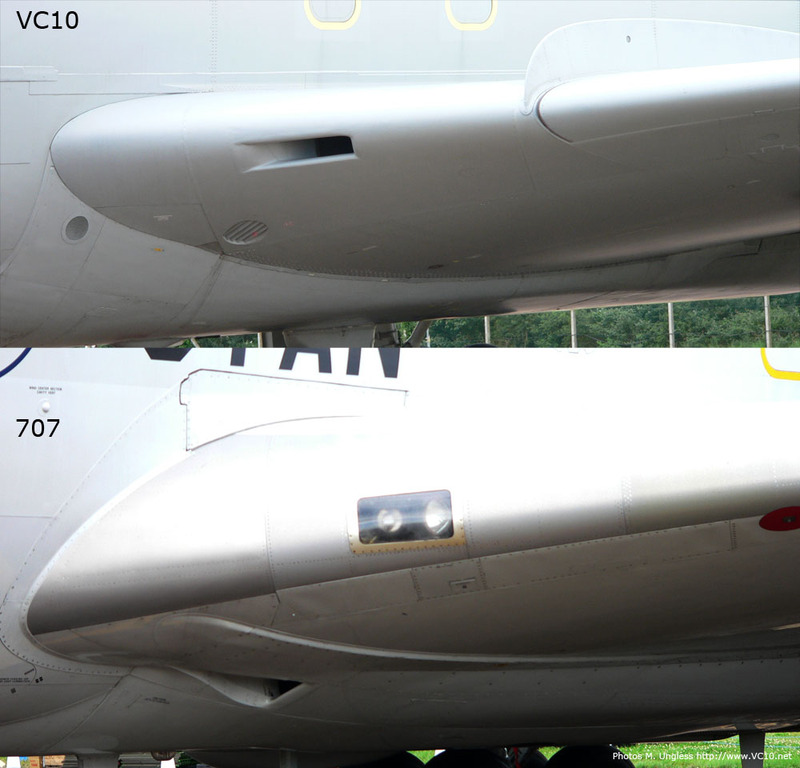 Of those three areas the second one was an important one on the VC10 design. Because of the 'hot and high' airfields that BOAC wanted the VC10 to operate to (Sir George Edwards mentioned Nairobi in particular) the aircraft needed very good take-off and landing performance. This drove the decision to put the engines at the back as that freed up the wing to deliver as much lift as could be generated from it. In doing this the design team also took away what's known as 'wing bending relief' from the engines, basically the weight of an engine hanging from the wing opposes a bit of the lift force that's trying to bend the wing upwards, therefore requiring less structure weight in the wing itself. That is one of the reasons that especially the Standard VC10 is more expensive to operate than a 707, its structure is slightly heavier for the same number of passengers (25.7% of MTOW as opposed to 24.6% for the 707). 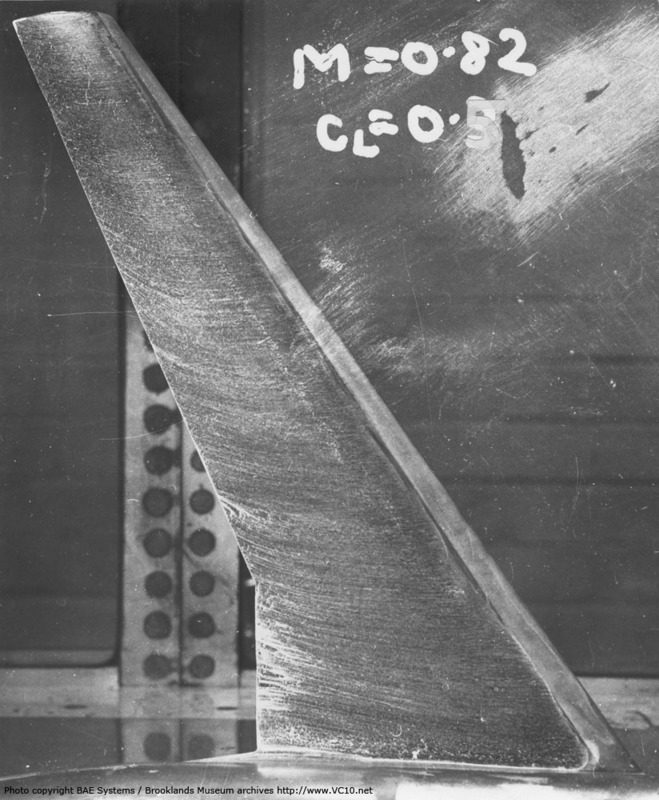 An early wing design being tested in the windtunnel after a modification to the leading edge. The flow pattern is being visualised with oil, producing the streaks on the model's surface. The area is derived from the lift formula by choosing a design wing loading (MTOW/wing area) and finding the CL that corresponds to the peak in the L/D curve. For the VC10 the wing area was initially set on 264.8 m2. When the wing was changed to improve its operating characteristics the wing area increased to 272.4 m2. Generally speaking this is the slenderness of the wing when viewed from above. A faster aircraft usually has a lower Aspect Ratio (AR) while especially gliders or man-powered aircraft need very high ARs. Another reason for a higher AR is when you need to operate from short fields. The problem here is that when you push the AR too high the cruise performance at higher Mach numbers deteriorates. Because of this the AR was set at 7.5 for the VC10 which is a normal number for an airliner, leaving it up to the flaps and slats to improve the slow speed handling and with that the airfield performance. The sweep of a wing is usually measured at the quart-chord line, a swept-back wing has a higher critical Mach number than a non-swept wing. 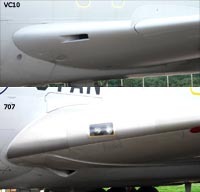 The VC10 wing has a sweepback of 32.5 degrees. The MMO or maximum operating Mach number for the VC10 was set at 0.886 for 31,000 feet and above. Apparently RAF VC10s were cleared to M 0.925 or even a bit higher for high speed cruise, although manuals do not reflect this. They do show that the designed MD or 'dive' speed of the aircraft is M 0.94, the critical Mach number will most likely be slightly higher than this. Later on in the life of the RAF VC10s the MMO was adjusted to 0.866, putting a bit less stress on the structure. This the ratio of the wingtip chord to the wingroot chord. A ratio of 1:2.5 provides a good approximation of the optimum lift distribution across the wingspan. I do not have the exact figure for the VC10 available but believe that it will not be far off this ratio. The chosen wing profile or section is perhaps the most important of all. In the history of aerodynamics wing profiles were always chosen from available profiles which were designed by research departments. The VC10 was the first airliner for which the wing profile was specifically designed. For this Vickers worked together with the Royal Aircraft Establishment (RAE), National Physics Laboratory (NPL) and the Aircraft Research Association (ARA) for over six months and together they designed a wing with a 'peaky' pressure distribution along the chord. This was so named as the airfoil produced a low pressure peak over the leading edge as opposed to a fairly constant low pressure section over a significant portion of the chord. 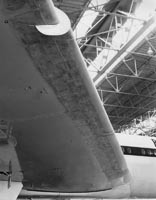 Much of the work on this wing must be credited to Mr. H. Pearcy at the NPL and Mr. B. Haines (ARA) as they came up with the idea for the peaky wing and developed it for the VC10. The result was a wing that was tuned to be super-critical, it maintained its flow by not only delaying the conventional flow separation but by moving it from its usual point on the airfoil section. This super efficient lift producer was tailored to avoid compression drag by deliberately creating an airflow expansion wave over the leading edge and providing space for the air to move. This delayed the onset of shockwaves which normally spoil the subsonic flow and thereby determine the critical Mach number. The end result was a wing which was very efficient at the top end of its speed range but it also worked well at the low speed end with flaps and slats extended. In some publications the wing was described as having a 'negative camber at the root' which, although not completely incorrect, does not reflect all the changes that went into this custom designed wing profile. 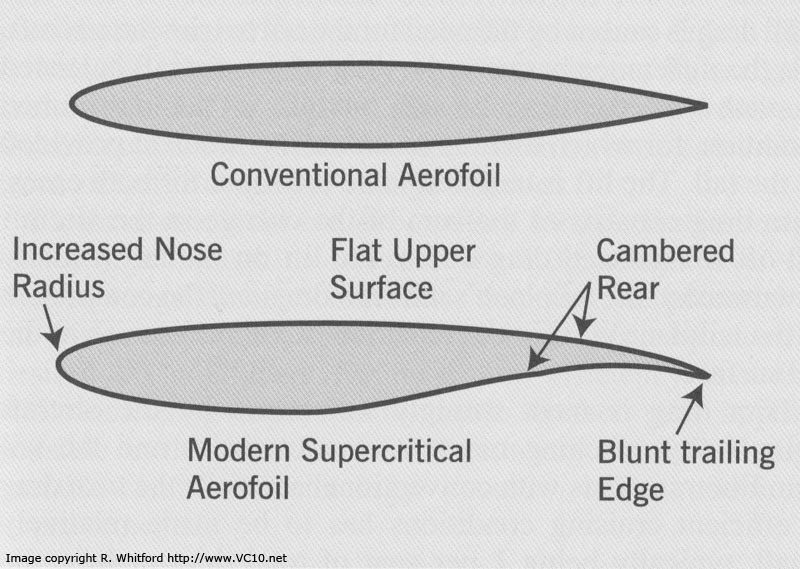 The differences between a conventional wing section and the supercritical section that was used on the VC10. Source 'Evolution of the Airliner', Ray Whitford 2007. A quote from the New Scientist magazine about the then new wing design. The statement that the camber changes towards the wing tip may not be correct. Source New Scientist, 21 June 1962. This comparison clearly shows that the 707 uses a much older non-supercritical wing section with a more pronounced curve on the top surface. A change in wing incidence (twist) or camber is used to fine tune the distribution of lift across the span, often also to prevent tip stalling which is an unwanted characteristic. 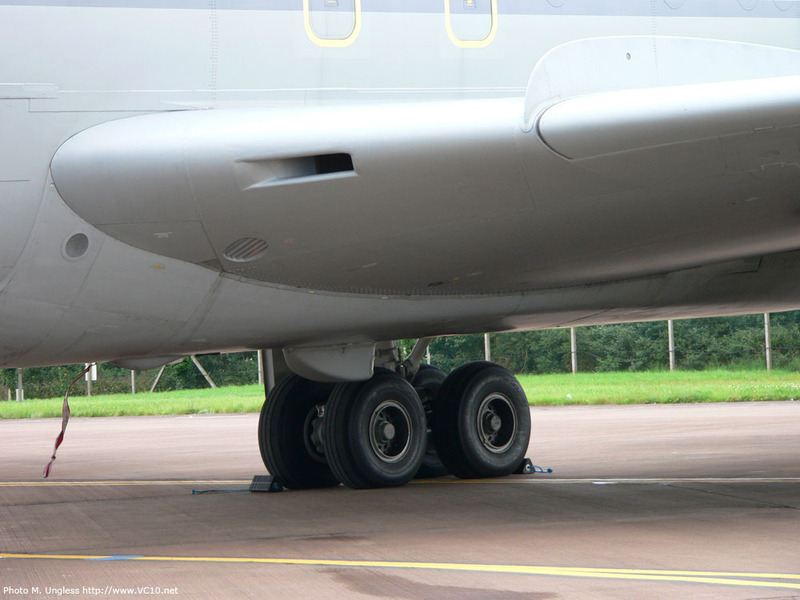 On the VC10 both twist and camber changes are not used as the main design worked well enough without them. The remaining issues that needed to be addressed to fine tune the stalling characteristics of the aircraft were resolved in other ways. This last parameter could be seen as a straight fight between the aerodynamics engineers and the structural engineers as the first group would like the thinnest wing possible while the second group prefers the opposite choice. With the custom designed profile of the VC10 a large part of this fight was over before it started as the wing design was already fixed by the stringent airfield performance demands. For the 1101 type this ratio was 13% at the root and 9% at the tips. Later in the development process this ratio was changed to 17% at the root when the wing chord was increased on the inboard section. See below for more about this. In April 1962 the completed prototype was rolled out of the factory for the first time and photos of this event show a very clean wing with one (almost full-chord length) wing fence at approximately three-quarters span to control the spanwise flow which would otherwise help spread the stalled section of the wing over the ailerons, rendering them ineffective. The wing tips were squared off. Both of these items would later change during the development of the aircraft. G-ARTA seen outside the assembly building for the first time on 15 April 1962. In this configuration G-ARTA took off for the first time on 29 June 1962 and initial reports from the flight test crew showed that the aircraft flew beautifully. However this was more a reflection on its handling, not its performance and as more of the flight envelope was explored and the performance numbers were evaluated a problem showed up. The aircraft produced more drag than predicted and in some cases buffet (localised flow separation) was encountered. In this configuration the VC10 could not meet the performance specifications set out in BOAC's order so changes to the design had to be made. G-ARTA's original squared off wing tips (left) and the modified 'Kuchemann' tips (right). Several of the tufts on the wedge between the two tailpipes show a reversed flow on this shot taken during climb at 23.000 feet. 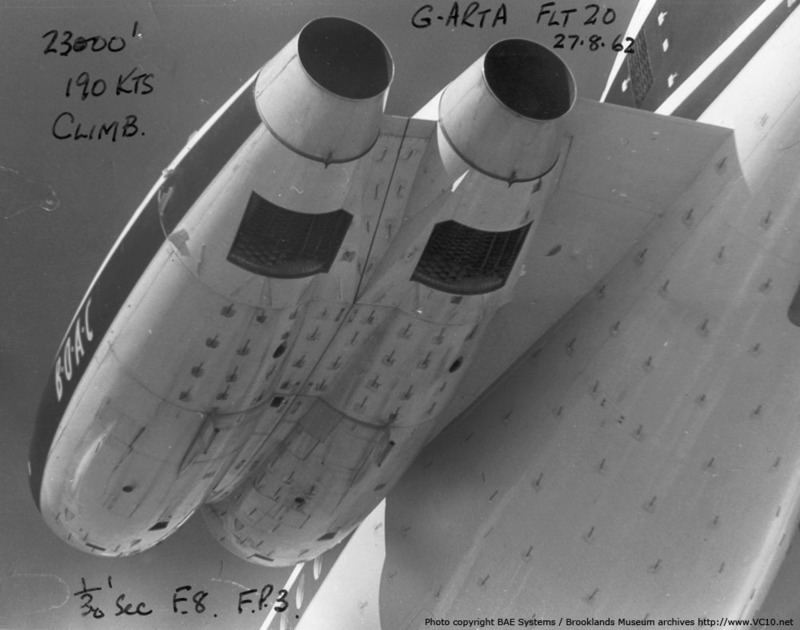 This view of a tufted pair of engines shows an interim configuration with the reversers temporarily blanked off but with beaver tails and extended stub wing. Slats taped over with balsa wood, cloth and adhesive dope to investigate leading edge changes. As assistant chief aerodynamicist Mike Salisbury explained during the 50th anniversary gathering at Brooklands in 2012 there were several areas that were investigated: the general finish of the aircraft, slat and flap fitting, engine nacelles and the wing leading edge profile. It was soon obvious that the wing tip vortex was much stronger than was anticipated from the wind tunnel tests. To counter this the squared off wing tips were exchanged for so-called 'Kuchemann' tips which feature a large radius curve from the leading edge to a sharp corner at the trailing edge when viewed from above, with these tips the wing span increased by 1.8 m (6ft). Also the slat housings were re-aligned to provide for a slightly different slat position when extended. G-ARTA was flown in a large number of different configurations to find out what would have the most beneficial effect on the VC10's cruise drag. 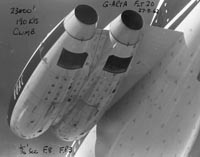 The engine nacelles featured a 'Seddon air flow step' between the two engines which consisted of a number of angled steps that should produce vortices and thereby 'fill in' the gap between the two tail pipes. Photos taken from a Canberra of tufted engine nacelles on G-ARTA showed that this feature was not working as it should and to correct this a number of 'beaver tail' nacelle extensions were constructed and tested. The wing's peaky pressure distribution was so new that not much was known about it, this may have led to the over optimistic initial performance guarantees to BOAC. The NPL and RAe were consulted about it and several modifications were tried out. For one of these the inboard two slats on each wing were locked out some 3 degrees and then taped over with liberal amounts of balsa wood, hessian cloth and 3M adhesive dope thus filling in the gaps. The flaps got a similar treatment and in this configuration the prototype performed several flights from Boscombe Down, only flying in dry weather obviously. The leading edge changes seemed to produce results so the aerodynamicists designed a new leading edge which could get the VC10's cruise drag down to where it should be. The costs of this modification were very high though as it required changes to the wing torsion box (the wing spars and associated ribs and skins that carried the main loads). This would have meant building completely new wings and changing a lot of the jigs on the wing production line. This was therefore named the 'rich man's leading edge' and Sir George clearly stated to the team: 'Find a cheaper way.' From this the 'poor man's leading edge' was designed which worked almost as good as its predecessor but was far easier to implement, requiring no changes to the torsion box structure. This leading edge was eventually fitted to the 1102 and later models as well as the Super VC10s. The large inboard wing fence is one of the results of the over 2,300 stalls carried out on G-ARTA. During these tests it was found that the stall was not adequately identifiable to the pilot in several of the tested cases. Also the inboard engines were starved of air at relatively low angles of attack. 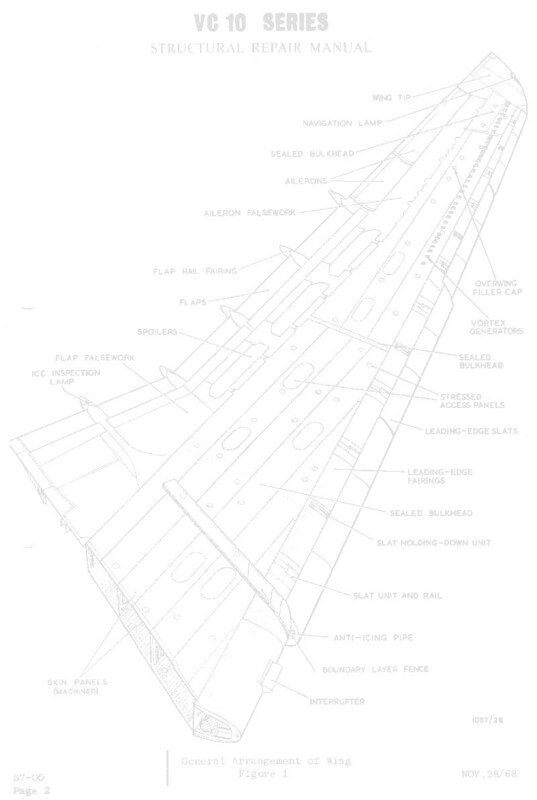 Several combinations of wing fences and leading edge disruptors were tried out and of these the large inboard fence at approximately 18% of the wing span as ultimately applied to all the VC10 versions, in combination with a second fence just inboard of the ailerons was found to be the best solution. This provided a localised vortex over the wing root which kept the air flowing to the inboard engines and also provided a more pronounced nose down moment at higher body angles. 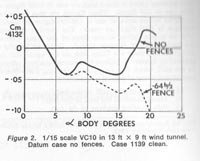 The CLmax with flaps out was slightly reduced by the inboard fence (see graph below) but this had to be accepted to provide adequate longitudinal stability and satisfactory handling qualities. It was in this configuration that the aircraft could meet the mandatory requirements as set out by the authorities, Brian Trubshaw states that the Company's test pilots refused to accept the aircraft without the inboard fence. The VC10 is one of the few T-tailed airliners to have a natural tendency for pitching nose down at the stall, if not the only one. This was mainly due to the fact that the engine nacelles were comparitively wide and therefore started acting like a low-set tailplane in high angle of attack situations. A case was made for allowing the VC10 to fly without a stick pusher but in the end a decision was made to install one as an added safety feature to prevent the dreaded super-stall condition that caused the loss of the BAC 1-11 prototype in 1963. This graph (apologies for the bad scanning job) shows the pitching moment with and without the outboard fence. 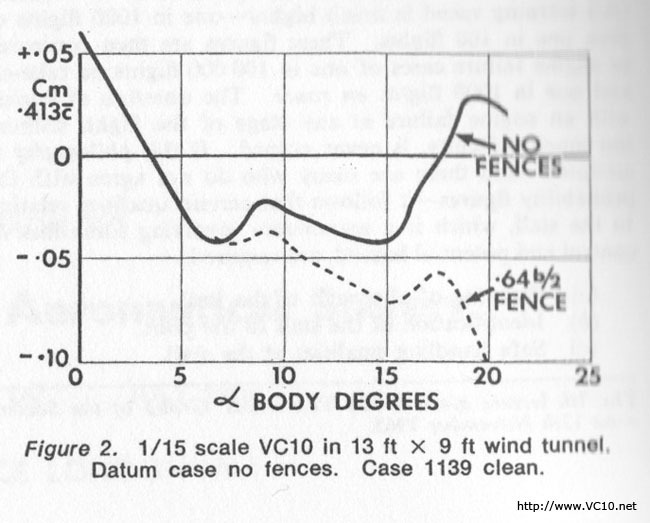 As shown the fence creates a negative (nose down) moment over the full body angle range while the case without fences would create a positive (nose up) moment above 18 degrees which could be dangerous. This graph was produced from wind tunnel testing and provided the basis for installing the outboard fence on G-ARTA's wing. 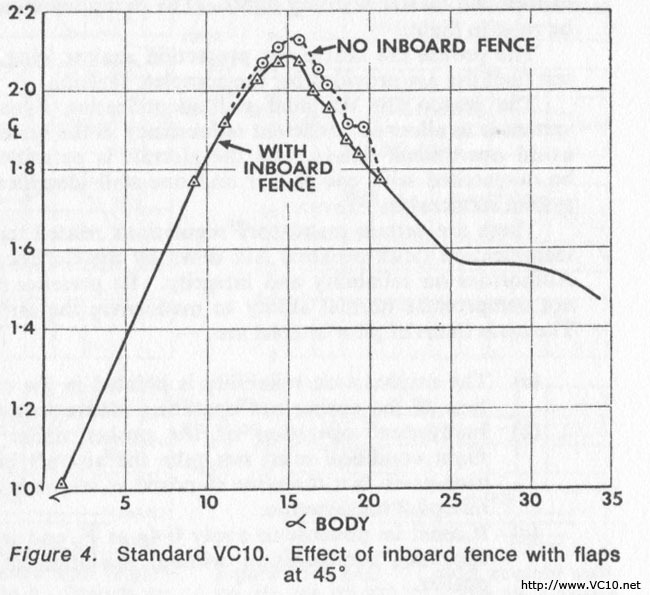 This second graph shows the impact of the inboard wing fence on the lift-coëfficient of the VC10 wing. Although this was slightly lowered the safety aspect was deemed more important. 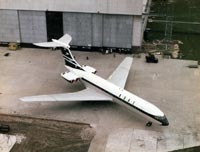 When the drag problems that caused the performance shortfall of the original VC10 design were encountered, the type 1101 VC10s for BOAC were already being built. Modifying these aircraft would cause their delivery to be delayed significantly as well as increase the price of the aircraft, and the decision was made to keep the wings as they were originally designed for the 1101 VC10s. Because of this the BOAC Standards had a performance shortfall compared to the other Standards that did incorporate the modifications to the wing. The 1101 wing is basically similar to the wing of G-ARTA as eventually tested, with full chord outboard wing fences and the large inboard fences which were fitted to all VC10s. The outboard fences needed a small rubber flap which closed off the gap between the fence on the wing itself and the section on the leading edge slat. 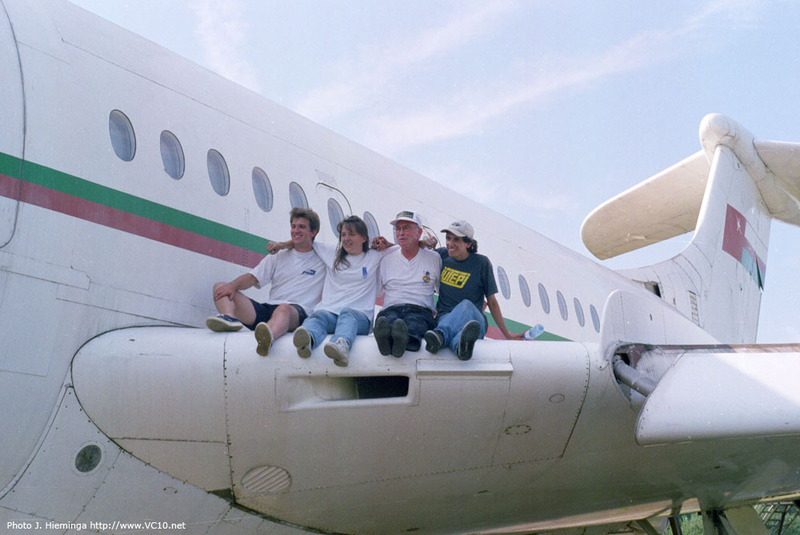 On G-ARVE, which flew an airtest after a major servicing, the stall behaviour was found to be pretty sporty. At the stall one wing dropped severely, causing some major headscratching and a repeat of the test, with the exact same result: the same wing drop as observed before. After landing an examination found that the rubber seal between the two fence sections was missing from one wing fence (the offending wing indeed). Apparently the two inch gap which was caused by this was enough to completely change the behaviour of the aircraft during a stall. 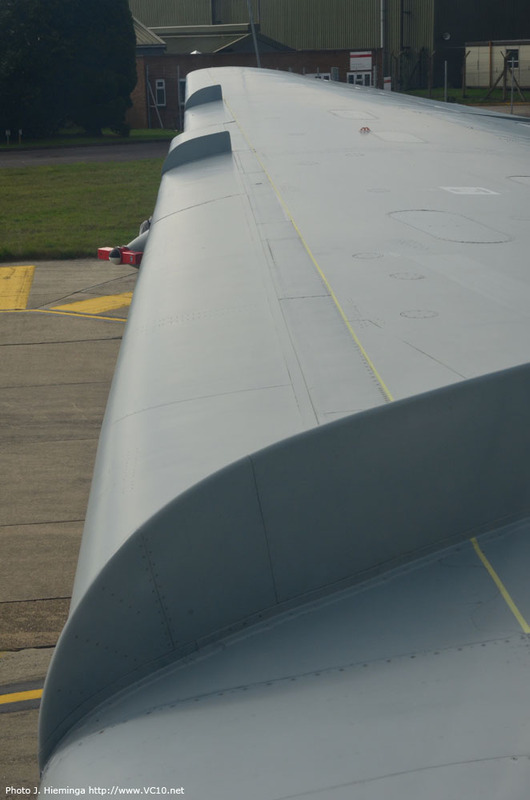 The inboard wing fence on the 1101 wing is positioned in such a way that it partly covers one of the fuel tank access panels on the top surface on the wing. Because of this the fence had to have a removable section incorporated to allow for fuel tank access during maintenance. 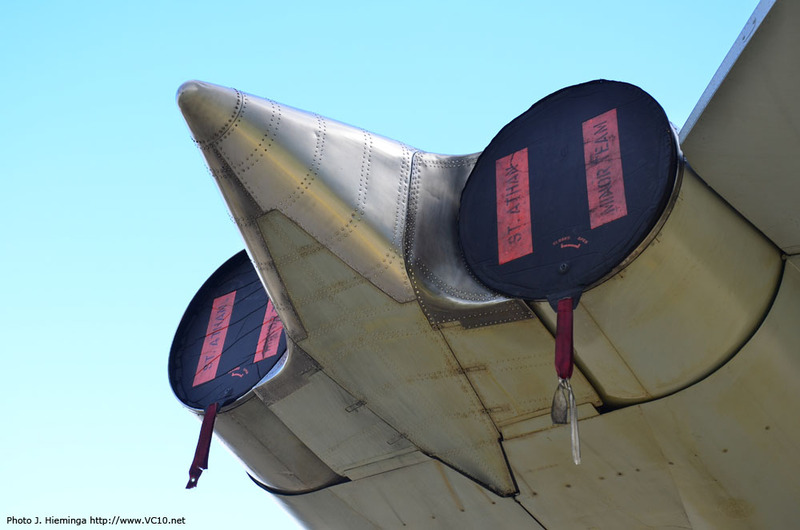 When looking over the top surface of the 1101 wing, there is a row of vortex generators which can be found in front of the spoilers. 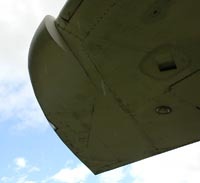 These produce small localised vortexes to keep more energy in the boundary layer, the area just above the wing where the air flow is influenced by the friction of the air against the skin. 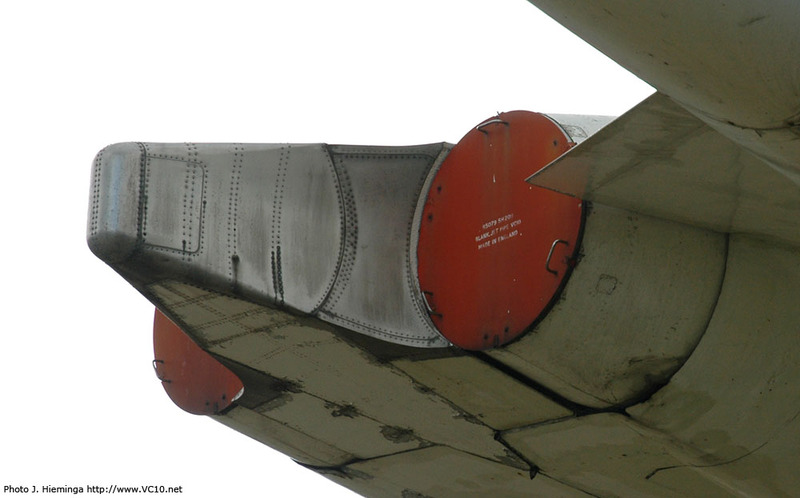 The vortex generators on the top surface of the 1101 wing can be seen sticking up on this photo. The outboard fence on the 1101 wing extended around the leading edge to the undersurface of the wing. The testing that needed to be done on the cruise drag issues caused the testing program to slip and the delivery dates for the various customers might have to be changed as a result. The decision from BOAC not to modify the 1101 wing meant that these airframes could be completed and used for route proving and other tasks. The 1102 and 1103 versions did need the drag improvements though so the various tests were not in vain but these two variants would end up with an intermediate wing configuration that was a first step from the original Standard to the Super VC10. The reason for the intermediate configuration was mainly because the stall testing for this modified wing had not been completed. The leading edge extension was incorporated over the two inboard slat sections but over the unslatted wing root this extension had to perform a transition to the approximate original leading edge. 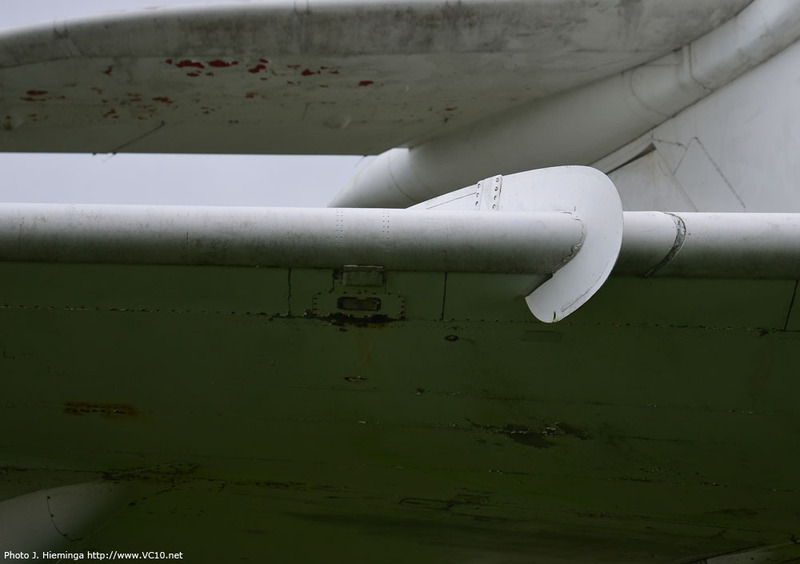 These aircraft showed some airflow instability approaching the stall and to remedy this a small triangular stall strip was added just outboard of the air intake. These stall strips make sure that the airflow around the leading edge will be tripped at a specific angle of attack. On some aircraft types these strips are as small as a cigarette but will still influence the stalling behaviour of an entire airliner. There was still some concern about the stall characteristics of the wing with the chord extension. The extended wing leading edge improved the buffet boundary diagram by removing the medium level bulge and this enabled the aircraft to cruise at a higher level, up to 41.000 feet, at the same weight. The stall concern in this case was fixed by adding an under camber to the wing tip of the type 1102 and 1103 VC10s. This kept the wing tip, which is well aft of the centre of gravity of the aircraft, flying at a much higher angle of incidence, thus giving a nose down pitch at the stall. On this 1103 wing the stall strip that was added is visible just right of the air intake. In comparison this Super VC10 wing on ZA148 does not need the same stall strip. The cambered wingtip on type 1103 A4O-AB. This was installed on the BUA and Ghana Airways aircraft and later on G-ARTA when it was converted for airline use. The wing fence configuration had not been finalised and this caused 9G-ABO and G-ASIW to end up with an underwing inboard fence which was later deleted. This was meant to improve the airflow over the inboard flap section but this turned out to be satisfactory without the additional fence section. On the modified wing it was also found that the outboard fence did not need to extend over the entire chord but could end at the slat edge. The step in the leading edge that was created by adding the wing chord extension created enough of a vortex to isolate the ailerons in a stall situation. So the 1102/1103 wing ended up with a short outboard fence, the large inboard fence was positioned so that it did not cover any of the fuel tank access panels and the stall strip was fitted on the inboard section. This photo shows the underwing inboard fences on 9G-ABO, the first Ghana Airways aircraft. The next evolutionary step would be the RAF type 1106 which benefitted from the full development program, and this variant ended up with the fully developed Super VC10 wing configuration with just a small variation in the outboard wing fence configuration. When the stall program had been completed it was found that the cambered wingtip was not needed. 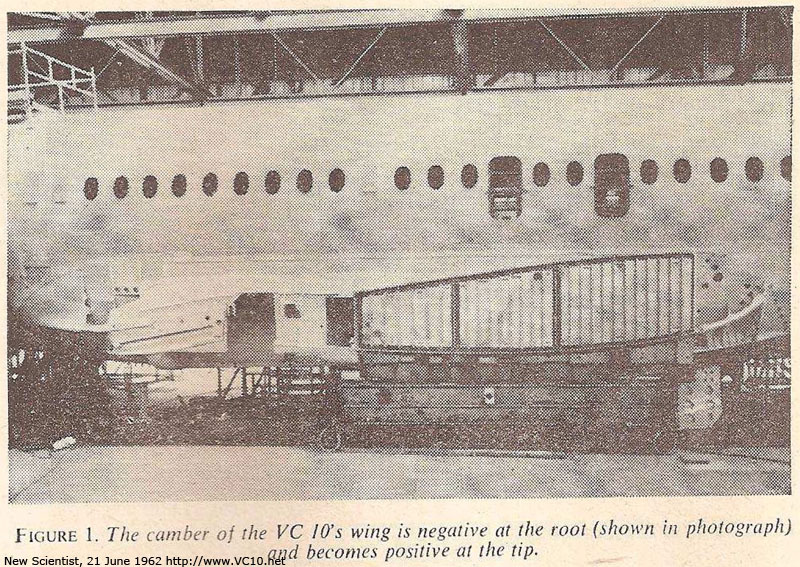 The VC10s did not display the super stall or deep stall which plagued most T-tailed aircraft and which had caused the loss of the BAC 1-11 prototype. The wide engine nacelles acting like a low set tailplane were responsible for this. The changes to the engine installation were not over either as a revised installation had been trialed on G-ARVE which would be used on the type 1106 and the Super VC10s. In this change the nacelles were tilted up by three degrees and moved outboard 11 inches. Also the trailing edge of the stub wing was given a flat back which further reduced the drag. In all these modifications improved the engine installation drag and they were installed on many of the 1106 and many of the BOAC 1151 Supers. The East African Airways type 1154 received all these modifications including a conical rear fairing between the engine exhausts instead of the beaver tail shape. This is the original beaver tail configuration that was fitted to all the Standards and many BOAC Supers. On the EAA Supers these conical fairings were used which slightly improved the drag numbers. 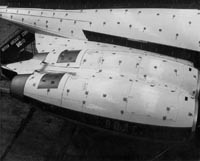 Compared to the nacelles on the photo on the left the rear end of the stub wing has also been cut back slightly and given a flat back. The inboard wing on the type 1106 and the Super VC10s was slightly different from the 'interim' 1102/1103 configuration again. Although there is still a slight kink in the leading edge it has been 'cleaned up' compared to the type 1103 and there is no stall strip on it anymore. The last change between the Standard and the Super VC10 was the outboard wing fence. On the Super VC10 there are two outboard wing fences instead of the single one on the Standard wing. Because of this the RAF's type 1106 looks like a regular Standard wing even though it incorporates the changes to the inboard wing that were also fitted to the Super. Looking across the leading edge of ZA147's wing shows the two small outboard wing fences that were fitted to all the Super VC10s. The development of the VC10 did encounter some stumbling blocks but this is nothing strange. Anytime something new is tried invariably some problems also turn up. The use of a specially designed supercritical profile for the VC10 was a huge step in aerodynamics and at the time knowledge of these profiles was slim. The designers of the VC10 were breaking new ground and during the thousands of hours flown on the prototype and the development airframes they were learning every day. From this they developed the VC10 until it became a solid earner for BOAC and the other airlines that operated it. Some variants were somewhat less economical than others but seeing as BOAC declined to include the various improvements that were suggested, this can not be fully blamed on Vickers. Also, the VC10 managed to fulfill all the promises made with regard to the hot-and-high performance that was requested. The fact that this meant that it was less economical to operate is a direct consequence of the choices that were made. In 2007 Dr. Jan Roskam, longtime expert on aircraft design, wrote a book called 'Lessons Learned in Aircraft Design' which covers a long list of examples where, with hindsight, decisions about structural, systems or aerodynamic design could have been made differently. 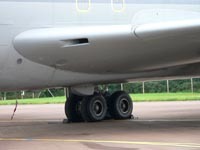 It includes the VC10 as an example of a powerplant installation that included a flaw in its initial design, which was solved by the installation of the beaver tail fairing. So 45 years after its first flight the lessons learned by the Vickers design team from the VC10 are still valid. The supercritical wing is used on almost any new airliner designed since the VC10 and many other aspects of the VC10's design have become standard choices in the aeronautical industry. The VC10 may not fly anymore but its legacy lives on. 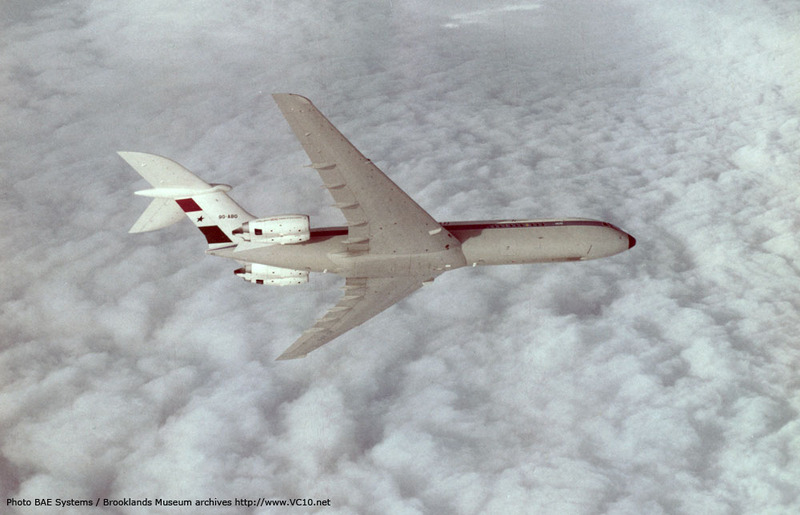 For more about the aerodynamic testing that was done on VC10s, have a look at the link below for a report from RAE Bedford on the cruise drag present in the Super VC10 design.